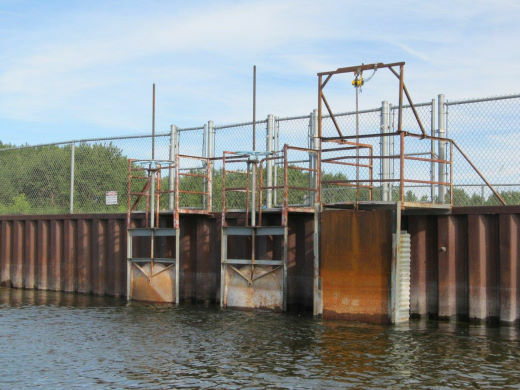 On April 27 the Good Spirit Lake Watershed Association Board (GSWAB), was permitted to open the control gates at Good Spirit Lake outlet. The water level at this time was 1,591.3 feet. The gate was then opened up. The summer operating level for the lake is between 1589.5 and 1590 feet. At the April 29 GSWAB meeting, the board agreed to operate the structure (open) until the lake reaches the desired 1590-foot lake level. Estimates are that when the structure is being operated at full capacity, the lake can be lowered by one inch per week. This however is variable as the lake can experience significant evaporation levels as well (up to one inch per day) so projections are that the gates will be opened for at least a couple of months. The levels will be monitored regularly and the gates closed once the summer operating level is reached. In 2014 and 2015 the Good Spirit Watershed Association Board along with Assiniboine Watershed Stewardship Association, EcoACTION - Environment Canada, Good Spirit Provincial Park and the Saskatchewan Wildlife Federation took on the project to revitalize the south end of the shoreline at Good Spirit Lake. 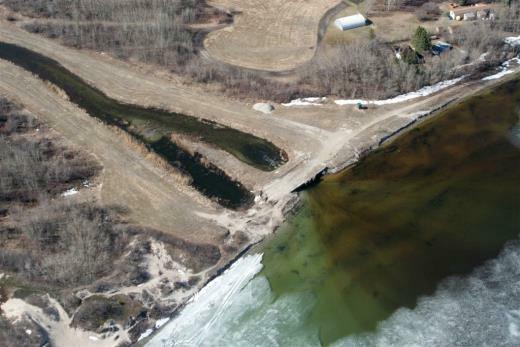 This involved reconstructing the shoreline for a more permanent solution to the shoreline erosion and prevent the risk of the possible washout of the lake's entire control outlet structure. For more information and pictures, click here. The Good Spirit Lake Water Association was established in 1986 under provincial law, and is made up of members from the R.M. of Good Lake #274, the R.M. of Buchanan #304, the R.M. of Invermay #305, the R.M. of Insinger #275, and the Good Lake and Buchanan Conservation and Development Area Authorities. Each of the member municipalities and C & D Authorities pay annual levies to administer and maintain the Watershed Association. Flood waters heading south to Good Spirit Lake, Spring 2006. 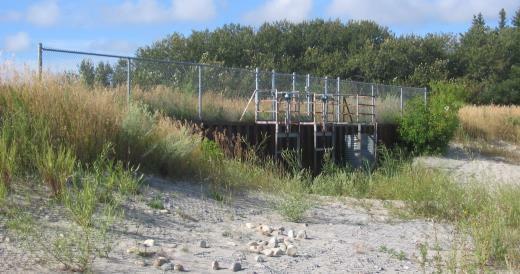 Sask Water provided technical and financial assistance to the Watershed Association to construct a control structure/outlet at the south end of Good Spirit Lake in 1989, and to improve the river channel downstream for approximately 5 kilometers. The total estimated project cost was $620,000, which was shared between the Good Spirit Lake Watershed Association members ($79,500), Ducks Unlimited ($160,000) and Sask Water ($380,500). Click here to see the daily lake levels of Good Spirit Lake as plotted by the Saskatchewan Water Security Agency. When spring runoff or rains causes lake levels to rise above the desirable summer operating range of 1589.5 ft. to 1590 ft., water will be released until the desirable summer levels are reached. If the water level after spring runoff or rain is below the desirable summer operating range, no water is released. If the lake level is above the range of 1589 ft. to 1589.4 ft. in the fall, water will be released until the lake level is in this range. Variations within the fall target range would be based on the capacity of marshes and sloughs in the watershed area to hold spring runoff. Minor variations outside the fall target range would be based on extremely wet or dry fall conditions. If the fall water level is below 1588.65 ft., no water will be released under any circumstances. 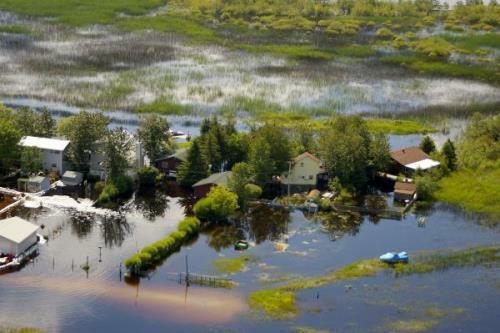 Our challenge is this: Let enough water out in the fall so that there is less chance of cabins flooding during spring runoff, yet keep enough water in so that the lake level is acceptable in case there is no spring runoff. The Watershed Board, with the guidance of provincial engineers and hydrologists from the Saskatchewan Watershed Authority, work to manage the lake level based on historical data and probability, current lake levels, and capacity of the marshes and sloughs in the watershed area to hold spring runoff. Why does the Watershed Board lower Good Spirit Lake in the fall? To reduce the potential for flooding of resort property, the lake has to have enough capacity in the fall to hold most of the spring runoff. On average, spring runoff and spring rains increase the lake level about 10 inches. But spring runoff has been as much as 4 feet, and as low as 1/4 inch. We have to be reasonably prepared for the big runoffs, like in 2006, 2007 and 2011. If the lake floods in the spring, why doesn't the Board open the gates and let the water out then? It is impossible to let the water out as fast as it comes in. In spring, when all the creeks and rivers are full, only 1 to 2 inches of water per week will go out of the man-made gate and outlet channel. That's not much when 2 or 3 feet of spring runoff could come racing into the lake over a 2-3 week period. Boaters generally like the lake high (1590 ft. or more), and beach users/dune walkers like the lake a bit lower (1589.5 ft. or less). When lake levels allow, the Board tries to provide balance between the two groups of recreational users, keeping in mind the erosive effects that high water levels and wave action can have on the shoreline. Over the past 41 years the level of Good Spirit Lake has fluctuated significantly. The graph below shows the historical highs and lows. Note that flood damage of resort properties begins at 1591.5 ft.
What does the Watershed Association do? As seen on the map, approximately 1,000 square kilometers of land naturally drains into Good Spirit Lake. Some of this land has also been improved, in that provincially-approved ditches are in place to drain otherwise unusable land and make it available for farming. This generates tens of thousands of dollars of income on an annual basis for farmers in the area. There are hundreds of cabins at Burgis Beach, Canora Beach, the Provincial Park and other resorts. As well, the beaches and sand dunes are a tourist attraction, and boating and fishing are popular. Good Spirit Lake is shallow (average depth 20 feet) and fluctuations in the lake levels become very visible. A summer water level of between 1589.5 feet and 1590.0 feet elevation is targeted by the Board, but reaching these levels is highly dependent on adequate amounts of spring runoff. One of the objectives of managing the lake level is to reduce the risk of flooding. 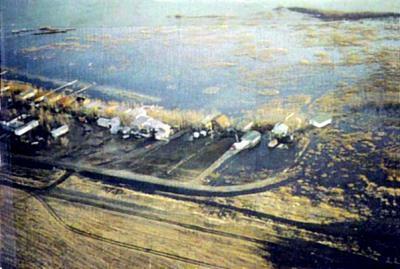 Flood damage to resort property begins at a water level of 1591.5 feet, and there are municipal restrictions on building development for most lots in the R.M. of Good Lake. High water levels and wave action can erode shorelines, beaches, and the sand dunes. 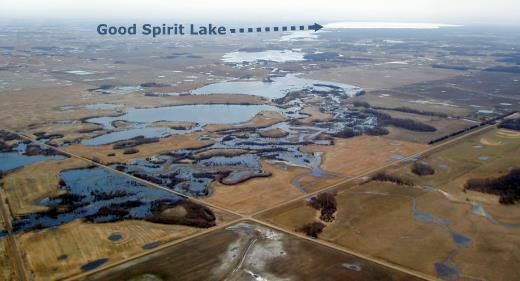 The timing and amount of water release has to be done in consideration of its effect on grain/hay land, trails, Ducks Unlimited projects, wells and property downstream from Good Spirit Lake. Water from Good Spirit Lake ultimately ends up in the Whitesand River south of Canora. No water was let out of the lake from 2001 to 2005 -- it was a drought! The control structure is at the south end of Good Spirit Lake. There are three large culverts that are controlled by gates. The control gates are shown above, high and dry from 2002 to 2005. Below, the lake water is much higher and the gates are open (2012). All contents are ©2019 RM of Good Lake #274 unless otherwise noted.